The title story takes quirky to a new level, as Mr. Ayau provides a running explanation of what makes a tragedy, and why this story fits that mold. Written as if it were a term paper, the story outlines the depth of the two major characters, replete with footnotes and subtopics in bold italics. Through this process, he artfully brings these characters into their ultimate conflict. This story/term paper moves logically from one place to the next: on the one hand building a neat little murder, and on the other, making the case for the tragedy, as classically defined. Whether intended or not, this title story is a hoot of a good read. Mr. Ayau’s quirkiness comes with humor—sometimes subtle, sometimes obvious—and just as the reader’s lips curl up in a grin, the edgy side of the story bubbles to the top, raising issues of discrimination, religion, health, fairness—just to name a few. Should the reader snicker at the pictures drawn of everyday people in everyday situations or consider the deeper meaning of these stories? Mr. Ayau uses active narrative like he was born to it—painting pictures with words that flow across the paper canvass drawing out the story in vivid detail. “Saturday afternoon. Lazy sunshine filters through the trees in the backyard. The lawn, freshly mown is a festival of mulched grass, or shredded paper and torn plastic wrappers and chopped up grasshoppers, of spiders scurrying with sacks of eggs on their backs.” One can smell the grass and feel the cool, freshly cut blades between one’s toes. Building characters the reader can identify with is one of his strong points. Across these 11 stories Mr. Ayau uses both first person and third person point-of-view effectively, although the stories told in the first person seem to be more striking in their ability to place the reader in the heart of the action as the story unfolds. The reader becomes the point-of-view character, thinking the thoughts and experiencing the five senses as they are so skillfully described. Regardless of point-of-view used, his characters express the feelings known throughout the world: frustration, desire, anger, love and the reader tastes the flavor of these emotions. The charm of a short story anthology is that the stories can be read out of order or from beginning to end as a logical progression. 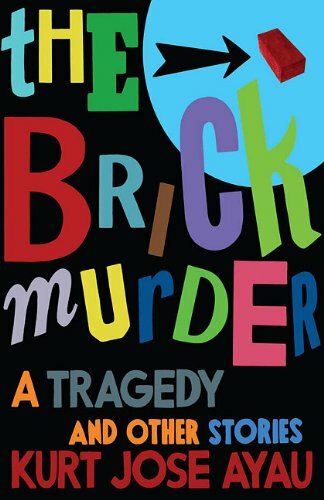 The Brick Murder: A Tragedy lives up to that charm; easy to read and yet with deep themes, this collection of stories is both entertaining and satisfying and all too often, laugh-out-loud funny. The winner of the Tartt First Fiction Award for The Brick Murder: A Tragedy, Kurt Jose Ayau presents a wide variety of well-honed stories that carry both quirky humor and edgy insight into humanity. Quirky and edgy—yin and yang.